Wall Street conduits conducting commercial mortgages from origination to securitization have been humming along at a far heftier clip so far this year compared with 2012. In May, nearly $4 billion in loans of all sizes were securitized through three large-pool CMBS issues, and June is poised to be the heaviest-volume month so far with another handful each in the $1.2 billion vicinity. And that's not counting the single-borrower, single-asset and agency multifamily (Fannie and Freddie) deals regularly coming to market. All in all, some $35.4 billion of private-label (non-agency) CMBS transactions have priced year-to-date through late-May - already approaching full-year 2012 issuance of $44.4 billion, reports Commercial Real Estate Direct. The encouraging news for the small-balance space is that many of these bond issues securitize dozens of loans sized at $5 million-and-under - with a surprising amount even below $2.5 million. With individual self-storage and manufactured-home community (MHC) collateral playing the biggest roles, the conduit arena is also readily securitizing portfolios of mostly small-cap CRE collateral. The general positive take-away is that active conduits are continuing to offer exceptional 10-year rates, often in the low-4s, for decently performing small income properties - as long as borrowers are okay with leverage in the mid- or high-60s or perhaps low-70s. 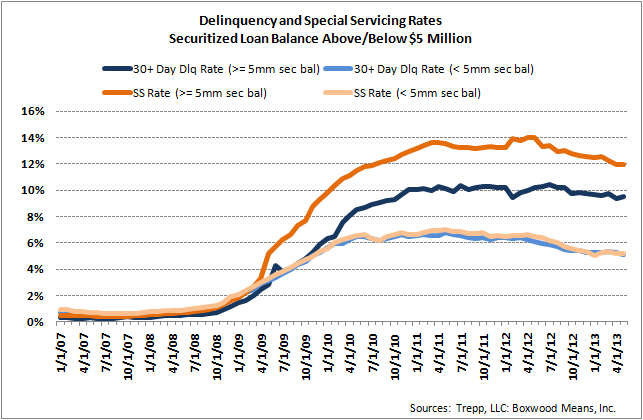 And it doesn't hurt that the 30-day delinquency rate for small-balance conduit loans has fallen for 14 consecutive months, and is now down to 5.14 percent - compared to 9.54 for those above $5 million, as Trepp LLC calculated exclusively for SmallBalance.com. Underlying the ongoing good fortune in the continuing low-yield fixed-rate investment environment, CMBS senior-class bond spreads remain about as tight as they've ever been amid strong investor (and borrower) demand - along with the decent-if-slow pace of economic (and CRE market) recovery across much of the country. Hence at least the conduit-lending marketplace's near-term outlook for small-balance borrowers seems reasonably bright. Of course a general economic reversal could curtail bond-buyer demand - in turn making lenders stingier (ongoing sequestration isn't helping). Nor would a substantial rise in interest rates help the conduit cause - and indeed we've seen spread-quote benchmarks become at least a bit more volatile and upwardly mobile of late (what with the Fed reducing its quantitative easing). But as small-balance mortgages securitized through the latest CMBS deals illustrate, 10-year Treasury yields and interest-rate swap rates hovering in the 2 percent vicinity are factoring to some of the best rates the space has ever witnessed. Predictably they also confirm that conduit lenders - like pretty much all debt sources - tend to quote small-balance mortgage spreads at least a bit wider than larger loans. With the recently priced transaction we'll shorten to GCJ12, nearly one-third of the 78 individual loans are in small-balance territory, with another handful well below $6 million. Collateral assets securing the smaller loans include hotel, retail, MHC, multifamily, office and flex properties, with rates ranging from 4.07 to 5.77 percent (but heavy in the low- and mid-4s). Originators of these loans were Citigroup Global Markets Realty, Jefferies LoanCore, Archetype Mortgage Funding, and MC-Five Mile Commercial Mortgage. As for small-cap portfolio deals, Archetype provided a $29 million loan, at 4.23 percent, secured by 14 northeast Philadelphia buildings collectively appraised at $39.55 million. Allocations to individual properties range from less than $700,000 to a bit over $4.5 million. The CMBS issue we'll nickname C14 securitizes several loans secured by portfolios comprised of two to four small-cap properties. Among the collateral are a couple Holiday Inn Express hotels in Sumner, Wa. and Graham, Tex., with Royal Bank of Scotland funding the loans at 4.88 and 5.14 percent, respectively. Liberty Island Group loaned $10.75 million against a four-property Virginia self-storage portfolio, at 4.14 percent. And Basis Real Estate Capital funded an $8.325 million loan secured by a couple Michigan retail properties, at 4.58 percent. Basis also funded a $5.5 million loan secured by four Tucson MHCs, allocated from $412,500 to just under $1.5 million, at 4.32 percent. RBS, Basis, Wells Fargo Bank and C-III Commercial Mortgage also funded another 20-some individual small-balance loans secured by mostly self-storage and MHC properties, along with a few retail centers. Rates on these assets range from 3.95 to 5.11 percent. By contrast, two of the transaction's largest loans had rates of about 3.66 percent, with several more in the further-upper 3s. Mid-sized loans tended to be in the low-4s. And another transaction we'll call CCRE8 pools about 10 individual small-balance loans, ranging down to $2.2 million, secured by retail, storage, multifamily, mixed-use and hotel collateral. Rates are mostly in the low- and mid-4s, but also include the $2.2 million mortgage from Cantor Commercial Real Estate secured by a Rockville Center, NY apartment property at 3.7 percent; and a $4.25 million loan from Natixis Real Estate Capital to owners of a limited-service Red Roof Inn in San Dimas, Cal., at 5.23 percent. Like community banks, conduits tend to be more willing than the low-rate GSEs or life companies to wade into secondary and tertiary markets. And similar to lending institutions with local expertise, conduits are generally more accommodating toward properties (and borrowers) that aren't top-tier sponsors. As for terms, conduits remain more aggressive than life companies on loan proceeds - but generally won't match Fannie and Freddie leverage levels running to 75 and even 80 percent in the multifamily sector. To wit, the American Council of Life Insurers reports that life company loan-to-value ratios averaged 60.22 percent, and debt-coverage ratios 2.2x, in the first quarter. The comps for conduits were 62.1 percent and 1.88x. But even some conduit lenders can be more aggressive than others. LTVs on larger loans securitized through the CCRE8 transaction were clearly more likely to reach the 70s compared to the smaller loans, which were mostly in the 60s. In contrast a large proportion of the loans pooled into the GCJ12 transaction - including about half of the smallest 18 - were funded at LTVs exceeding 70 percent. And a few reached over 75. And as the C14 deal demonstrates, larger loans are far more likely to start with interest-only periods. In fact the 11 largest loans in the pool all featured some interest-only elements - while nearly all the smaller loans amortized from month one. Looking forward it's safe to suggest that conduits will continue answering plenty of calls from mortgage brokers repping small-balance borrowers. And we expect that conduits will continue to incorporate many of these assets into their pools as a means of collateral and geographical risk diversification.